In less than a week, I’ll be at the BlogPaws Conference, an event I look forward to every year. It’s hard for me to express in words what this conference means to me and how it’s changed my life and cemented my passion for cat advocacy and rescue, but I’ll try, with the help of some photos. 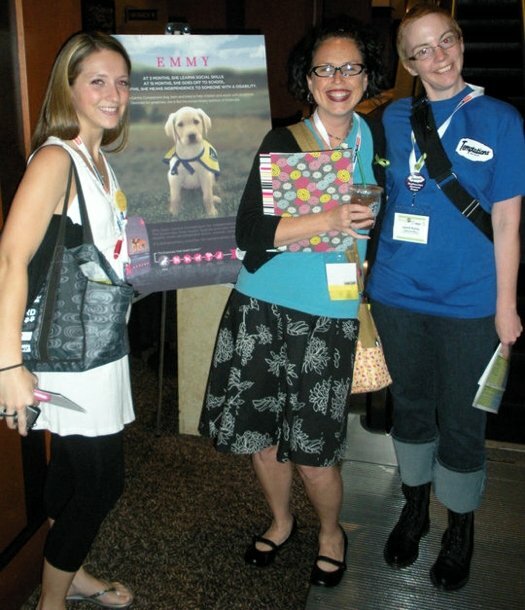 I was invited to speak at the first conference, BlogPaws 2010. I went, not knowing quite what I was getting into, how well the event would be organized, or how good the workshops would be. I know how much effort it takes to organize even a small conference — I myself had organized (with a lot of help) two small conferences, and I knew what a logistical maze that could be. I was very pleasantly surprised on all counts. 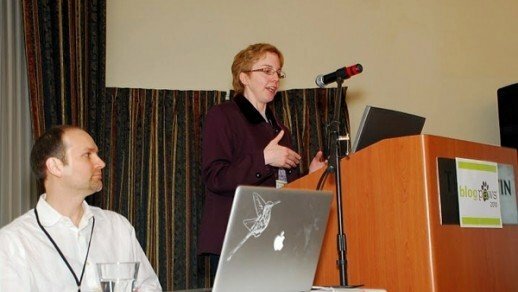 At BlogPaws 2010, I was part of a panel discussion on practical tips for search engine optimization. What I didn’t expect was that the BlogPaws organizers would decide, based on the success of the first conference, to hold a second conference in 2010, this time hoping to attract more people from the western US. I was kind of bummed out because I knew I couldn’t afford to go to two conferences in one year — but fortunately, a brand stepped forward to sponsor me and a couple of other bloggers, and I was able to attend. Because I didn’t speak at BlogPaws West, I had the time and energy to socialize with my fellow pet bloggers. Before I began meeting other people who were crazy passionate enough to have made a commitment to write about them, I’d felt sort of isolated. 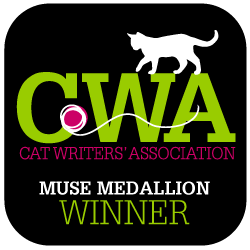 Sitting at my computer in my rural Maine apartment, I knew I was making a difference for you, my readers; I knew there were other cat bloggers, but I had no idea just how much we’d have in common until I met them in person. 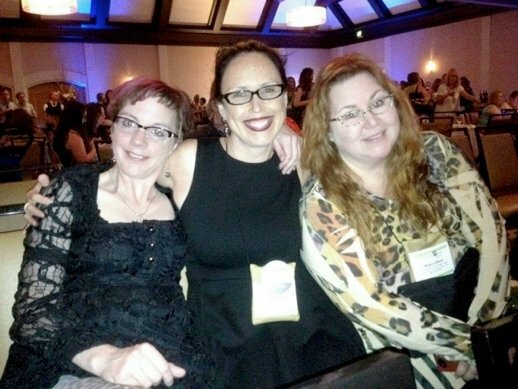 BlogPaws 2011: Angie Baily of Catladyland, Joanne McGonagle of The Tiniest Tiger, and me. BlogPaws 2011 was set in Washington, D.C., on the eve of Hurricane Sandy Irene (thanks for the correction, Rachel). There were some incredibly dramatic happenings: Two transporters were driving a clowder of kittens from a high-kill shelter in the South to meet Robin Olson, author of the blog Covered in Cat Hair and co-founder of Kitten Associates, a Connecticut-baed rescue group. They arrived at the hotel just ahead of the storm, and a bunch of us oohed and aahed over the cuteness in our midst. But somewhere during all the petting and purrs, somebody noticed that one of the kittens’ spay incisions was popping open. We fortunately had a bunch of veterinarians there, but unfortunately, none of them was licensed to practice in DC. Nonetheless, they did some first aid and Robin and her partner, Sam, hit the road as fast as they could, hoping to get home before the storm and get those kittens to their vet ASAP. The whole BlogPaws community came together to help Robin, Sam, and the kittens, and that’s when it clicked for me: We really are a community. No matter how far apart we live and how unique each one of our blogs are, we’re united by our love of animals and a universal kindness and compassion toward those who depend on us to be their voices. BlogPaws 2012 was set in Salt Lake City. Once again, the conference was chock full of education and entertainment. I was grateful to be a finalist in the Nose to Nose Pet Blogging Awards, along with several of the friends I’d met over the years. 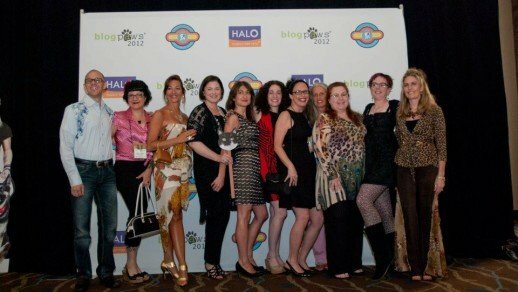 The whole gang: A group of my cool blogging friends at the Nose to Nose Awards Red Carpet Event. With each BlogPaws conference I attended, my passion for cats grew. As I learned more about rescue efforts and what I could do to help get cats adopted, I became more active in that area — but nobody was more inspired than Dorian Wagner of Your Daily Cute. Since last year’s conference, Dorian has become very active in rescue advocacy in her South Florida home and has begun arranging transports of cats from high-kill shelters in her area to shelters and homes in the North. I’ve gotten to meet some of the cats who have benefited from her hard work, including Samuel L. Catson, who landed at HART of Maine, the shelter where I volunteer. I’ve made more friends through BlogPaws than I ever made in my efforts to socialize in my daily life. Maybe it’s because it’s easier to start a friendship when you already know you have at least one shared interest — who knows? 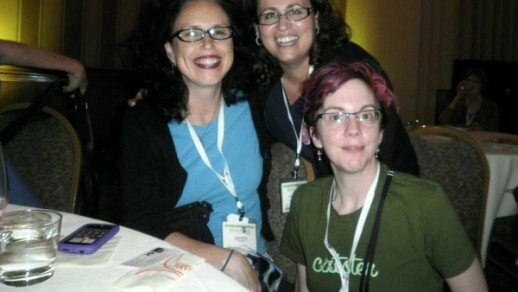 But if it hadn’t been for BlogPaws, I’d never have met two amazing women whom I’m honored to number among my best friends. Two women I’m proud to number among my best friends: Angie Bailey of Catladyland and Robin Olson of Covered in Cat Hair. I can’t wait to see what this year’s conference holds. I am once again honored to be a finalist in the Nose to Nose Awards — and this time I’m up for Best Meow Blog. I love the Nose to Nose Awards because they’re judged on merit. They’re not a popularity contest where you have to go out and whore for votes and get people to go to a website, thereby earning that website lots of traffic while really not having much benefit for you, the blogger. After 10 years of writing Paws and Effect and four years of BlogPaws conferences, I know for sure that the one thing I really want to do with my time, energy and talent is to work with, and speak for, cats. I want to show the world that low-cost spay/neuter really works; that behavior issues can be resolved; that it is possible to understand your cat’s health issues — and, more than anything else, to take my cat knowledge to the public at large. I may be an introvert, but I am a very good public speaker. I’ve been told I have a good radio voice, and I’m not at all scared to sit in front of a camera. Maybe I’ll meet some people at BlogPaws who can help me make my dreams come true. I bet it’ll happen!